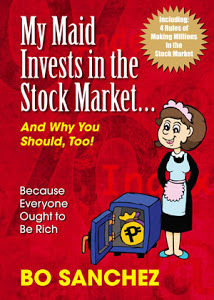 Today, I just wanna share you these good news about the Philippines Stock Market written in the business section of International Venture Capital and Private Equity News website (ivcpost.com) and one writen by Darwin G. Amojelar inside InterAksyon.com. Read below. 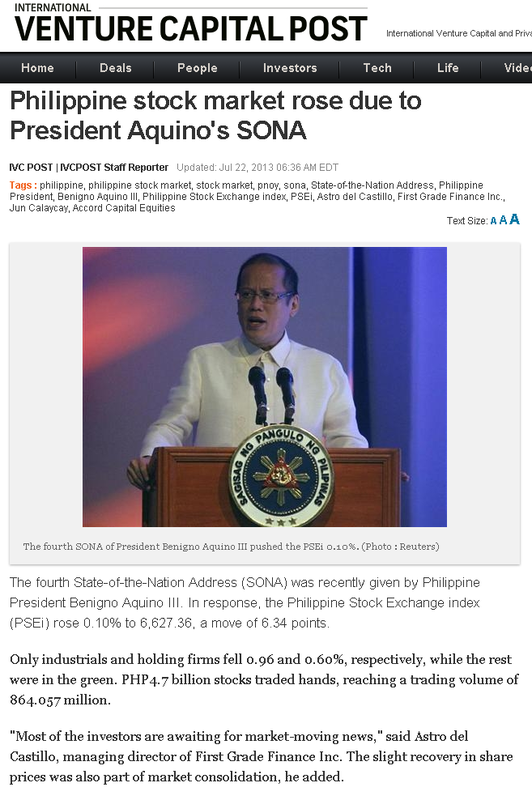 "The fourth State-of-the-Nation Address (SONA) was recently given by Philippine President Benigno Aquino III. In response, the Philippine Stock Exchange index (PSEi) rose 0.10% to 6,627.36, a move of 6.34 points." "The last four FVR SONAs moved the market higher by an average of 0.32 percent, apace BSA's first three marginally better at 0.35 percent. GMA’s impact averaged 0.16 percent, while [Estrada] was the only president whose SONA 'adversely' affected trades with the index sustaining losses averaging -3.83 percent," Calaycay said.